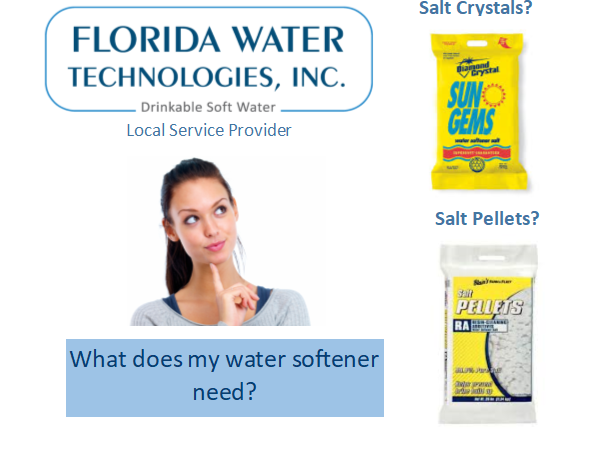 When you are at the store, do you find yourself asking the question, “What type of salt do I use with my water softener?” Trust me, you are not alone. In fact, this is one of our most popular questions asked by our customers. Jacksonville Florida soft water systems require the use of salt, but should you use the salt crystals or the salt pellets? Why are salt crystals better than salt pellets? That’s it. You can now go back to doing what it is you were doing before you ran across this blog. OK, I’ll keep going just for you. Water softener salt in the crystal form is referred to as solar salt. It’s naturally produced when the sun dries out highly saline sea water. This salt form is 99.6% pure salt. With no additives, solar salts won’t leave behind a residue inside the water softener system. This purity will extend the life of your water softener and won’t require much maintenance of the brine tank. Salt pellets are manufactured with additives that may can collect inside the water softener. Over time this collection of materials could cause damage to the water softener which will require a repair. You will need to clean the brine tank more often and have a higher risk of damaging the water softener. How much water should be in the brine tank? Checking your salt level in your brine tank should be done at least monthly. Considering the number of times your water softener regenerates will determine the number of times you’ll need to check and add salt to the tank. For excellent efficiency, we recommend the salt in the brine tank always be at least 3-4 inches above the water level, but less than four inches below the top of the brine tank. If you are seeing water inside the tank, you will need to add salt immediately. When salt levels drop too low, you run the risk of not having conditioned water. Regularly check your salt levels and don’t let the salt in the brine tank fall below one-quarter full of salt. If needed, and before adding new salt to the brine tank, always be sure to loosen any encrusted salt that may be adhering to the perimeter of the salt keeper and make sure any large pieces are broken up. If the salt has formed one solid mass, also known as bridging, you can manually break up the mass by pouring hot water over the salt bridging– making it easier to break up and remove.